A Qatari company has airlifted 165 cows into the tiny Arab state to help ease a shortage of dairy products caused by a blockade from its neighbors. Saudi Arabia, the United Arab Emirates, Egypt and Bahrain cut ties and severed transport links with Qatar last month after alleging it supported terrorists. The airborne bovine delivery is the first of hundreds expected over the coming months as the Baladna farm, based just outside Doha, looks to ramp up fresh milk production. “Eighty to 90% of the [fresh milk] market is currently dry by the Saudi embargo,” Baladna CEO John Dore told NBC News over the phone Wednesday. Although the company had long-standing plans to begin shipping the cows into the country, Dore said it decided to speed those up with the onset of the blockade. The animals arrived on a Qatar Airways cargo flight from Budapest, Hungary, the company said. 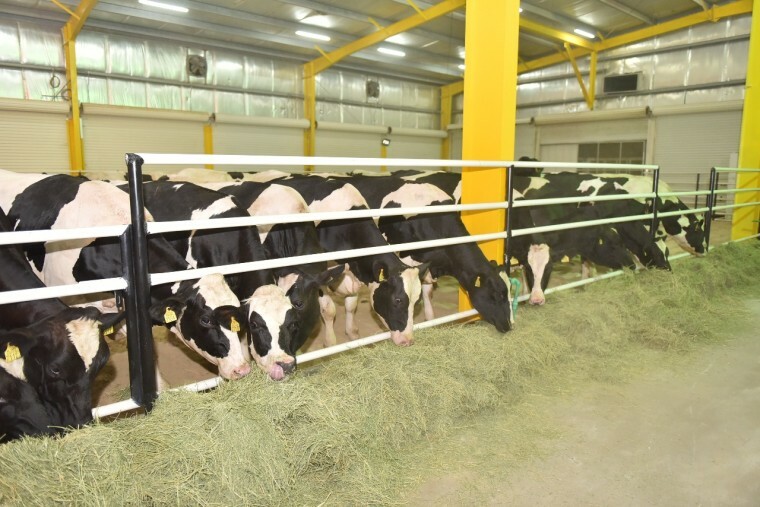 Photos posted to the Baladna Facebook page Wednesday displayed what it said were the freshly delivered cows grazing in a temperature controlled indoor facility. Baladna says it will fly in a further 4,000 cows from the Netherlands, Germany, Australia and the U.S. in the weeks ahead. The aim is to be able to produce for 30-35% of Qatar’s fresh milk needs by November, Dore said. Because it is a desert peninsula and has only one land border, which it shares with Saudi Arabia, Qatar has been forced to seek alternative arrangements for food imports since the dispute with its neighbors began. According to Reuters, Saudi Arabia and the UAE provided $309 million of Qatar's $1.05 billion of food imports in 2015. Much of them, especially dairy products, came over the Saudi land border. The likes of Turkey and Iran have stepped in to fill the gaps in recent weeks, shipping in food and dairy products. Turkish Economy Minister Nihat Zeybekci said Wednesday that his nation had sent 197 cargo planes, 16 trucks and one ship to Qatar to meet its daily needs in the last month. U.S. Secretary of State Rex Tillerson also met Wednesday with the king of Saudi Arabia and officials from other countries lined up against Qatar in an attempt to ease the dispute.